Although there has been an increasing interest in rural tourism in terms of research, training and teaching in recent years, its conceptualization and the relationships between concept and strategy are still poorly represented and not well understood. The need for such a critical understanding is particularly crucial as rural areas experience rapid change, and as tourism is viewed as a key element of development and regeneration. 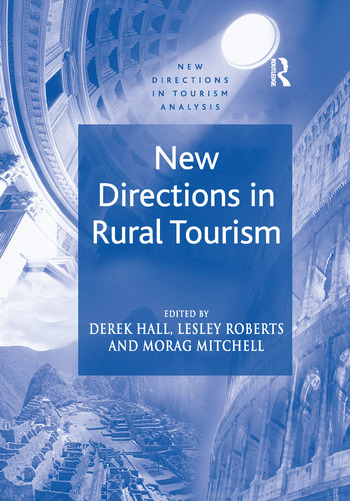 This volume provides an interdisciplinary approach to new directions in rural tourism, drawing on the latest conceptual thinking and evolving strategic roles. It brings together case study exemplification from the UK, Denmark, Norway, Austria, Spain, Slovenia, Poland, New Zealand and the Caribbean. It debates such key issues as sustainability and niche marketing. The book thus provides accessible material drawn from a range of environmental and cultural contexts and focuses attention on the nature and interrelationships between local and global issues in rural tourism and development. Contents: Part I: Context: Tourism and the countryside: dynamic relationships, Derek Hall, Morag Mitchell and Lesley Roberts. Part II: Conceptualization: New directions in rural tourism impact research, Steven Boyne; Rural tourism and sustainability - a critique, Richard Sharpley; What is managed when managing rural tourism? The case of Denmark, Anders SÃ¸rensen and Per-Ã…ke Nilsson. Part III: Experience: Encouraging responsible access to the countryside, Lesley Roberts and Fiona Simpson; The host-guest relationship and its implications in rural tourism, Hazel Tucker; Animal attractions, welfare and the rural experience economy, Derek Hall, Lesley Roberts, FranÃ§oise Wemelsfelder and Marianne Farish; Authenticity - tourist experiences in the Norwegian periphery, Mette Ravn Midtgard; Rural tourism and film - issues for strategic regional development, W. Glen Croy and Reid D. Walker. Part IV: Strategy and Management: Strategy formulation in rural tourism - an integrated approach, Hans Embacher; Networking and partnership building for rural tourism development, Alenka Verbole; Integrated quality management in rural tourism, Ray Youell; The role of education in the management of rural tourism and leisure, Patricija Verbole; Ecotourism for rural development in the Canary Islands and the Caribbean, Donald Macleod; Relationships between rural tourism and agrarian restructuring in a transitional economy: the case of Poland, Lucyna PrzezbÃ³rska. Part V: Conclusion: New directions in rural tourism: local impacts and global trends, Lesley Roberts, Morag Mitchell and Derek Hall; Index. Derek Hall is Professor of Regional Development at The Scottish Agricultural College in Ayr, Lesley Roberts is Senior Lecturer in Tourism at the University of Northumbria in Newcastle-upon-Tyne and Morag Mitchell is a Researcher for the Rural Policy Group at The Scottish Agricultural College in Aberdeen.